My Scale Model-making Course at Central Saint Martins is part of the college’s short course programme. It is offered a few times in the year, first usually in February-March, again during the Summer and finally around November. It’s a 5-day course normally run over 5 consecutive Saturdays (except for the Summer School) and it takes place at CSM’s impressive new building at Kings Cross. .. or, if your system can’t swallow this mouthful, it will probably be quicker anyway if you just Google ‘David Neat Scale Model Making CSM’. The course is very similar to my original ‘Model-making Techniques Course’ which I have been running since 2006. One significant difference in the ‘Scale Model-making Course’ at CSM is that more time is devoted to creating surfaces and painting in the final two Saturdays, including new work on the use of digital images to create effects in ‘real’ models. The other significant difference is that since it is normally run over a month as opposed to Monday-Friday, advantage can be taken of time between sessions, perhaps to finish off exercises or even try additional ones. However this entirely depends on personal circumstances and is not a compulsory aspect of the course. I do feel it’s important though that the course is kept a little flexible, allowing it to adapt to individual needs and to any shared interests in the group. For this reason some of the following are either/or options which can be decided while we are working. For example, both soldering and scale figure making are included in the schedule here but their relevance to the group (or individual) will be discussed beforehand. Introduction: Fundamentals of good model-making. Looking at selection of materials for construction. Working with ‘foamed Pvc’. The importance of drawing. Measuring and marking out using scale ruler and try square. Guidance for accurate cutting. Using customised sanding tools. Building in layers using the ‘template method’. Using superglue, double-sided tape, Pva wood glue and UHU. Technique of gluing ‘from outside the join’. Make a section of wall using sheet Pvc and Kapa-line foamboard, including interior wall mouldings and window. Looking at selection of fine-scale materials for detailed construction i.e. thin sheet materials and ‘rod & strip’ materials. 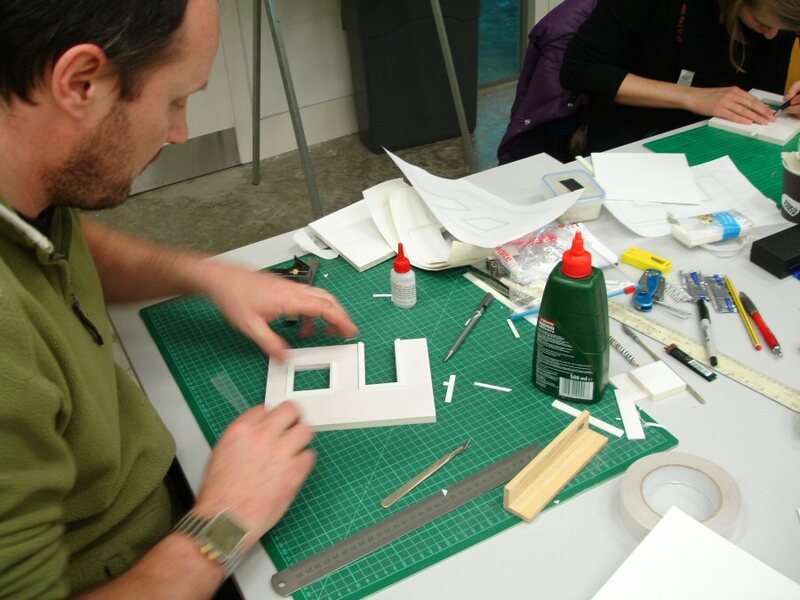 Building furniture in stencil card or Pvc using the ‘template method’. Using obeche wood or balsa. Quick method of ‘turning’ chair or table legs. Demonstration of how to solder in thin brass. Either make 1-2 pieces of 1:25 scale furniture using stencil card, sheet Pvc, styrene or obeche wood or make a 1:10 scale upholstered chair using sheet Pvc and foam. Achieving regular curved shapes in polyurethane foam (Kapa-line) and styrofoam. Ways of coating/strengthening foam. Materials for soft modelling. Using wire or wire mesh as armatures. Modelling on an armature with Super Sculpey polymer clay. Figure reference sources. Applying decoration using a liquid ‘relief medium’. Shape a curved cornice decoration for the wall piece using foam and styrene strip. Model a 1:25 scale figure in Super Sculpey. Creating scale brickwork and other relief surfaces in foam inc. breaking down or embossing. Different methods of texturing with polyfilla. Using ready-made relief papers such as vinyl wallpaper. Creating surfaces using digital prints i.e. repeated patterns, photographed textures. Ways of ‘texturing’ photos. Creating plant/tree effects using ‘scatter’ materials. 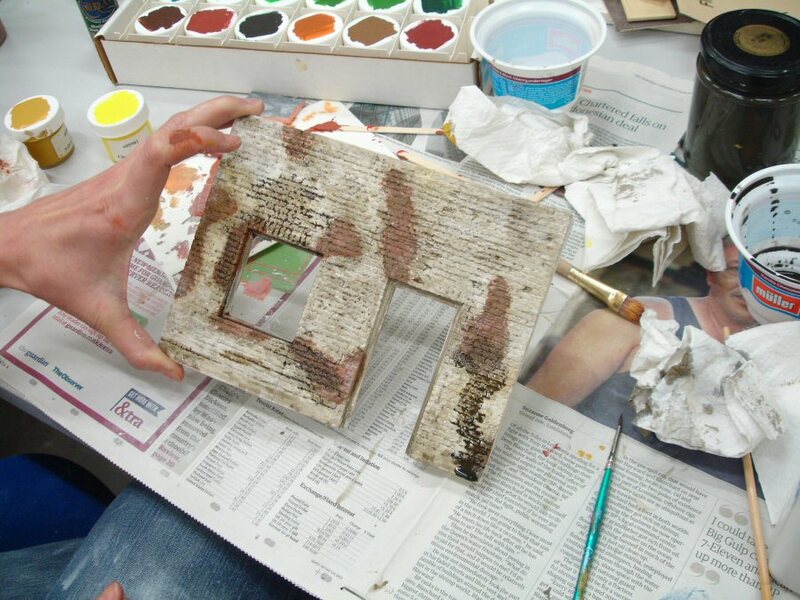 Create surfaces for interior and exterior sides of wall piece. Produce small samples of other materials and effects to start a sample book. Importance of preparing or ‘priming’ surfaces. Using acrylic paint, gouache, watercolour, tempera and ‘cold enamel’ paints. Useful brushes. Techniques of ‘light to dark’ washing or ‘dark to light’ dry-brushing. Using stains or varnishes. Importance of making tests and keeping samples. Using special additives such as crackle medium and paint retarder. Simulating wood with Pvc or styrene. Using pencil or pastel colours. Use the materials and guidance provided to paint/finish your model examples and test- samples. Hi David. Will this course be running again in the future? I can’t say at the moment. It was a nice place to run it but I took issue with the hours allowed (10.00-4.00 .. too short, in my experience). Instead I’m focusing more on my ‘Model-making Techniques Course’, much better value for money! Hi David..I am from India. Can I enroll this course. I am stepping into miniature projects. Before that I want sacling modelling drafting etc. I am new to this. Is this course useful to me. Can I take online classes? I am able to understand the way you explain the things. Can you help me out in this. I’m afraid I’m not doing this course at the moment .. instead, the other one ‘Model-making Techniques Course’ I’m sending you a course description. Dates are here in the ‘Courses’ section. No, I don’t do online classes .. this site is my form of that. HI, the link to the CMS course doesn’t work and when you google your name, it just comes back to your website again. I would like to register and know the fees. I also cannot find the relevant short course on the CSM website (other than an online one….??) Can you help? Thanks, but I’m afraid I’m not running the CSM course at the moment .. only my ‘Model-making Techniques course’. See the info for that here. Hi, I would like to join the model making course, may I ask for further information please? Thanks for your interest. You will have to apply to Short Courses at Central Saint Martins, using the link I’ve given. I was wondering if this course would be suitable for me? I have recently started working for an Automation Center of Excellence where we design a lot of robotics for production lines. I am involved with the design team and we would like to start making scale models of our concepts. Is this course more geared towards architects? my background is in product design so I have some experience around model making. I contacted you in the past about another course you run – Model making techniques, would it be possible to do both courses together in block? These courses would be very beneficial to me in my work and I know that the rest of the design team would get something worthwhile from them too, do you ever give these courses onsite – we have a design studio in house. I look forward to hearing back from you.. Thanks for your enquiry. ‘Scale Model Making’ at CSM and my ‘Model-making Techniques’ course are practically the same .. the main difference being the first is over 5 Saturdays and the second 5 days in a block. Neither of them are suitable enough for your purposes, there’s a lot you wouldn’t need and an equal amount specific to you that isn’t covered. I would have to design a different course. I’ll email you as soon as I can. Thanks for your enquiry. I’m sorry to say that University of the Arts requires a minimum age of 18 unless the course is specifically designed for younger people. In the case of mine I’d have to agree, because I’d be more than a little nervous considering the use of scalpels etc. Sorry to disappoint! I was wondering if this course is suitable for beginners. I’m quite creative and crafty and have made a small model in the past for an interior design exercise (albiet rather amaturishly), but it was something I found I really enjoyed. I’ve worked in scale before and therefore have a basic understanding of technical drawing. Also are spaces for classes starting on the 22nd October 2016 filled up? As the direct link you provided for the course could not be found on the website. Hi David, thank you for your prompt reply. Ah I see, that’s a shame about the cancellation, it would have been ideal to have been able to start so soon. I’ll just have to wait until February. Thank you again. Great ! Thank you for your kindness and your fast answer. I’ll be happy to learn with you! I’m french (35 years old) and I work in Paris as a propmaster/set designer in advertising. I’m also miniaturist (1inch scale). I would like to move in London and work as Scale Model Maker. I think the better way for me is to take courses with you. So am very interested in this course, but I would like to know if I would undestand it (my english level is quite good but not perfect !! ), and if you have a 5 day bloc course planned for winter. (It would be difficult for me to buy Eurostar ticket every week. Maybe you have an idea for a cheap accomodation to stay in London in October – November ). Can you help me to find the better way? I would be so grateful if I could be added onto the list to find out the next available dates. Thanks for your interest in the courses. No, the course at Central Saint Martins is not a good option for you .. the other one, the ‘Model-making Techniques’ course which is 5-days Monday-Friday would be much better. Have you seen that the next dates are already there .. November 28-December 2? I’ll add you to the mailing list though. I do have a list of accommodation in the area but it needs updating .. I’ll send it as soon as I do .. but I can suggest now that AirB&B could be the best solution .. it has been for a few past students. Could You please send me details of the next 5 day block course when you have them? I’m afraid I won’t be doing the CSM 5-day block for a while because normally it’s only in July and I can’t do it July next year .. but I’m just about to post the date of my next 5-day block ‘Model-making Techniques Course’, practically the same, .. beginning 4th April next year. When will your next 5 day block course be taught? It will be a while before my next ‘5 day block’ at CSM .. but I’m planning the next 5-day ‘Model-making Techniques Course’ for April. If you like I’ll send you details when I know for sure? Is this a recognized course with recognized certificate at the end as I am thiinking of a career change. Well .. yes, the course would certainly ‘count’ because, although I can’t vouch for the number of employers/companies who know about my courses, my name and work is known, principally because of my book and increasingly because of this website. There is also a certificate issued by CSM/Artscom as proof of attendance. However, a 5-day course can be little more than an introduction .. if you’re new to the work .. and it’s by no means a quick replacement for countless additional hours exploring and perfecting the skills and building up a portfolio of examples which prove what you can do! I’m sure you get my meaning. I am very creative and love to build things from scratch could you give me an example and I will do my best to make it and email a few photos. I’ve been thinking about this and the best ‘example’ I’ve landed upon so far is a classic red telephone box! Good as an exercise because it involves firstly going out and doing some actual surveying .. getting first-hand measurements, photos of details etc .. and everyone can find at least one fairly near, even now! Good also because they won’t remain on the streets forever sadly and they need to be honoured/recorded before they go .. and what better way to do it? Good also because it involves the ground-skills .. fine and accurate cutting; solving construction; problem-solving how to do the top; observation and simulation of ‘what happens to’ many of them (grunge enthusiasts should particularly like this! In fact, the further I think about this the more opens up! .. part of the challenge could be to ‘dress’ or transform one, represented in model form. So it could also be a design challenge. Good model-makers really do need design capabilities! In fact .. I might publicize it as an open challenge and present the best results here?! Hi David, I am 63yrs old and I find it very interesting course as a Hobby. I am from India so coming to London and learn during weekends would be difficult. Do you have straight 5 days courses in Oct or Nov? I would relaly be interested to learn. Many thanks for your interest in the courses. I’m afraid that there won’t be another 5-day ‘block’ version until Easter 2015 (whether starting on April 6th, 13th or 20th hasn’t been decided yet). This year I can’t offer one in the Autumn because of other work commitments. I’ll add your email address to my mailing list and let you know when I know anything more definite. Hi David, I love reading your blog! I am really interested in taking the Scale Model-making Course this autumn but I can’t find it anywhere on the CSM website. Do you have a link directly to it please? Yes, it’s odd, the way they’ve indexed the info there! Here’s the link .. hope it doesn’t nose-dive! Do you have similer course during this time? There is .. but too close to the edge, September 1-5! In any case it’s looking like that course is already full, if everyone so far commits. Hi David. I am really interested in the course! It sounds exactly what I am looking for. However, I am not from London and wondered if you have any short courses planned as a week intensive or block consecutive day course rather than one split over a couple of weeks? Just I would love to come and stay in london and attend! Thanks for your message! I’ve sent you an email. Many thanks, David, shall I enquire CSM about this course? Yes, you need to book with them if you’re interested, through their website csm.arts.ac.uk under ‘Short Courses’. Hi David, I was browsing about architecture model making when I came across your site. I am interested in this course and would like to know when is the next one. Many thanks. Hello Suki, Yes, sorry I need to update the page with the next dates. I’ll do that now!